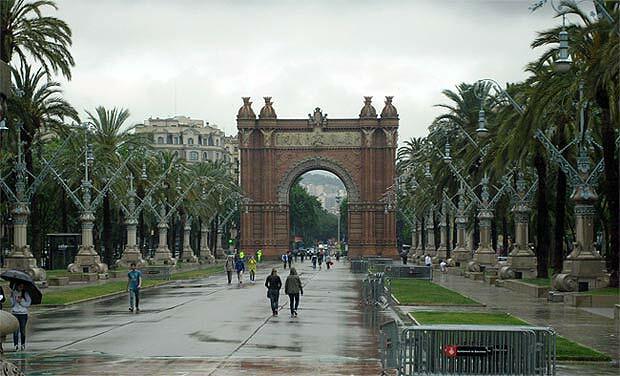 The Arc de Triomf in Barcelona (Catalonia, Spain) photo. It was built as the main gateway for the 1888 Barcelona World Fair by architect Josep Vilaseca i Casanovas. It's a beautiful arch with an adjacent park and one of the city's iconic landmarks now. There are images symbolizing agriculture and industry on one side, and commerce and art on the other. The shields of the 49 Spanish provinces and the coat of arms of the city of Barcelona are at the top of the arch. Address: Passeig de Lluís Companys, Barcelona, Spain.